After a flurry of tournament activity in March, several players have entered into contention for the 2007 Poker Player of the Year race, but one name continues to be the class of the field after the first quarter of the year. Playing perhaps the finest poker of his career, poker pro J. C. Tran not only continues to lead the POY race but also has expanded on that lead he took over in March. Tran, who already in 2007 has two World Poker Tour final tables to his credit, added to his stellar WPT performance with a victory at the WPT's World Poker Challenge in Reno during March. That championship, his runner up finish at the L. A. Poker Classic at the beginning of March and his final table finish in the WPT's Tunica stop have given the longtime poker veteran a healthy lead in the POY as we head into April and also has made J. C. the first $2 million man for this year. Tran should hold this lead for some time, as he is one of those tournament players who will plays most events on the circuit. James Van Alstyne moves up this month to take the runner up slot behind Tran in the POY race. Van Alstyne is a consistent casher in the tournaments that he enters, represented by the six cashes that he has achieved so far this year (with four of those being final table finishes). He finished a very respectable fourth at the WPT's Shooting Star tournament at Bay 101 in San Jose and also has a propensity for playing many tournaments on the schedule. While he may be behind Tran at the moment, he could be one player that could seriously keep the pressure on J. C. as the current tournament season moves along. One of the newcomers to the Top Ten this month is the most recent champion of the European Poker Tour's Grand Final, which was battled for at the end of March in Monaco. Gavin Griffin overcame a huge field of 706 runners for the EPT Championship (and also beat a final table that included Ram Vaswani, Andrew Black and Marc Karam) to take the title, launch himself into the third place slot in the 2007 POY race and become the second $2 million man of the year. Griffin is a younger player that has demonstrated that he has the game to be able to compete at the highest levels and, with some excellent performances in the U. S. and other foreign events, could be a formidable force when it comes down to the end of 2007. Another newcomer to the POY this month is the previously mentioned Marc Karam. Karam has benefited perhaps the most from changes in the scoring system that allow for the larger foreign tournaments to be counted. Karam's two final tables have occurred during the Aussie Millions and his final table at the EPT Grand Final. The Canadian does play in the States and, if he can continue to play the game he demonstrated in foreign tournaments, might be a constant on the POY list as the year rolls along. Still another newcomer, but also a very familiar name, lands in the fifth place spot as April begins. 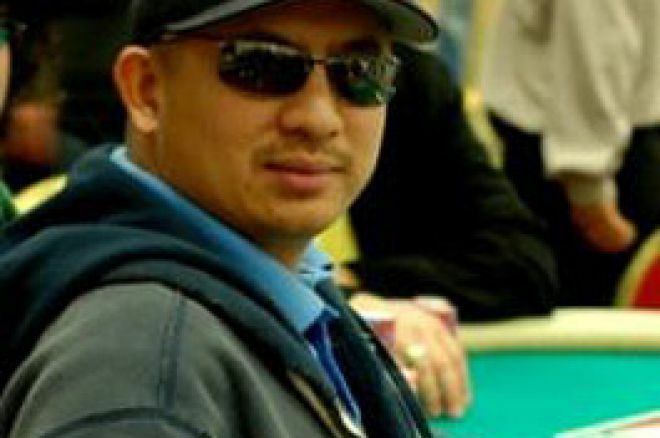 David "The Dragon" Pham has made five final tables and earned seven cashes in 2007 to move into that slot this month and it seems that Pham has his game working very well also. He had two victories during the Winnin' O' The Green tournaments at the Bicycle Casino in Los Angeles, then finished a strong third to Tran at the WPT World Poker Challenge. Pham is a highly dangerous player that, if he can continue this roll in not only the high-dollar events but also the smaller tournaments, could bypass everyone in front of him to assume the lead in the POY. The next five slots are covered by a mixture of men who have been on the 2007 POY already and some newcomers. The runner up at the WPT World Poker Challenge, Juan Carlos Alvarado, is new in the sixth place spot with William Edler (a final table at the same Reno event) taking seventh and WPT Bay 101 Shooting Star champion Ted Forrest in eighth. John Hennigan (January's WPT Borgata champion) and Eric Hershler (March's WPT L. A. Poker Classic champion) are joined in a three way tie for the ninth place position by the WPT's Foxwoods Poker Classic champion, Raj Patel. Familiar names abound in the next ten players as well, including the first woman to appear in the POY race. Joanne "J. J." Liu has risen to just off the Top Ten in eleventh place, with other notables such as Randy Holland (leading all players with nine final table finishes), Gus Hansen and Andrew Black arrayed in the Top 20. These players all deserve watching as the year rolls along. April should be a very active month when it comes to changes to this list. The WPT Championship event going on at Bellagio will be loaded with the cream of the poker world as they vie for that title and the World Series of Poker Circuit continues on with a stop at Caesars Palace. The Irish Open will be battled out in April as well and could be one of the foreign events that has some impact on the 2007 POY. While there's roughly 2100 points that separate first from twentieth in the POY race, a championship performance in April could thrust new contenders into the mix for the 2007 Poker Player of the Year crown.